In a study of UK IT professionals about children’s use of digital technology, many spoke of their fears surrounding safety and screen time but also of a need to improve not only children’s technical skills but their emotional digital literacy. This post is co-written by Adi Kuntsman, Senior Lecturer at Manchester Metropolitan University and co-lead of the Digital Disengagement research cluster; Imogen Rattle, Research Associate on the Digital Disengagement project in Russia and the UK, and PhD student at the University of Leeds; and Gerard Devney, Research Assistant on the project and PhD Student at Manchester Metropolitan University. 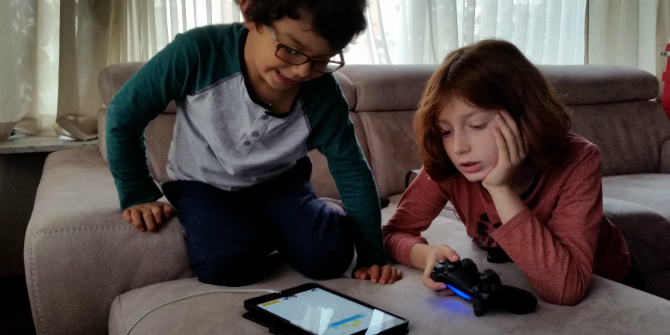 ‘Screen time v play time: what tech leaders won’t let their own kids do‘, ‘Silicon Valley parents are raising their kids tech-free – and it should be a red flag‘ – headlines like this have become common in recent years. Sometimes, the articles that follow invite readers to consider the dangers of digital saturation for today’s first world children, privileged enough to be digitally literate and to have access to multiple connected devices, unlucky enough to be overloaded by them. Other times there is also a sense of blame, directed towards the tech leaders who design ‘stuff’ for the rest of us to use, while not letting their own children near it. But those are media stories – exaggerated and sensational. What about the real IT professionals, who live and work away from Silicon Valley, away from Google and Facebook headquarters, away from the (US-centred) glamour of big tech? How do they see their children’s (digital) futures? In our small, UK-based study, we found a range of concerns IT professionals have about their children’s use of digital technologies, and a range of solutions. None advocated going entirely tech-free, but many spoke of the need for emotional digital literacy – something that cannot be taught but is only acquired with age. Despite their extensive technical skills, IT professionals we interviewed were fearful of the digital world their children are growing up into. As part of our ongoing study on digital disengagement – a voluntary refusal of digital communication technologies, devices and platforms – our team conducted 10 interviews with IT professionals from across the UK, in their mid-thirties to mid-forties. The focus of the interviews was their concerns about digital technologies and the ways in which they limited their use by: not owning a smartphone; leaving social media; uninstalling apps; encrypting online communication; or physically moving away from devices and gadgets. Although our initial focus was the adults’ own ‘disconnective practices’, many of the interviews turned to the subject of children, even when the interviewees were not parents themselves. The overall sentiment was of nostalgia, sadness, fear. Reflecting on their own childhoods, many noted they were glad to have grown up without smartphones or the internet, that they found it ‘scary’ seeing children on tablets, and felt deeply worried about raising their children in the world of constant digital connectivity. Supervising the use of technology/screen time, including not allowing the use of certain platforms or services (such as Facebook, or email), until a certain age. Limiting their own sharing of information about their children on social media, in particular, their photos. Teaching their children how to navigate the digital world; a solution brought up by many as an idea, however vague and unclear in its actual implementation. And here comes the paradox. One would think IT professionals would be the best parents to pass on digital skills to their children – including how to manage and limit digital communication technology, or how to use it safely. But in a world saturated with digital platforms and devices, it is not the new technical skills that are most precious rather, it is emotional digital literacy, which is different from computer literacy. Emotional digital literacy can be ‘taught’ to some extent but some of it, as our interviews make clear, comes with age and cannot emerge prior to one’s biological and social readiness. Glad to have grown up without smartphones and the internet, and mindful of their own use of digital technologies, the IT professionals we spoke with seemed helpless in the face of what awaits their kids. This post represents the views of the authors and not those of the LSE Parenting for a Digital Future blog nor of the London School of Economics and Political Science.